Ich gegen mich – Körperverstand. With pain but also with tremendous joy I realise that my childhood is over. I’m not a child and not a grown-up yet, stuck in adolescence. Permanently fighting my parents, my friends, myself, life – fighting the whole world, but being full of fear and doubts. The light-hearted spirit of my childhood is gone. Instead uncontrollable changes in my body and soul take over. My thoughts become conflicts with myself and other people – a daily fight against myself for myself. I drown in disorientation and comparison to other people. And I have so many questions: Who am I? What’s my truth? Where is my place to be? What are my dreams and goals? When is the time going to come and what will it do to me? And do I really have to grow up? A young woman is ready to fight her fear and doubts in order to grow up. Whatever may come, she wants to face it! 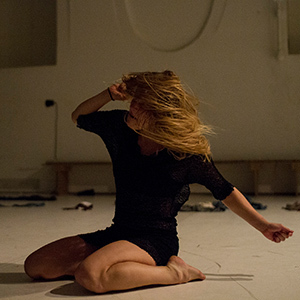 A dance performance following a child’s transformation into an adolescent, revealing all her emotions – self-destructive but beautiful at once.